Applications can generate a lot of events when they're running. However, most of the time, the only way to know what's going on is by looking at the logs or running queries against the database. It would be nice to let the users see what is going on in an easy way, so why not build an activity feed to see in realtime, every change made to the models of the application? In this tutorial we are going to build a simple Node.js REST API with Express and Mongoose to work with generic measurements, let's say for example, temperatures. Every time a database record is modified (created/updated/deleted), it will trigger an event to a channel in realtime using Pusher. 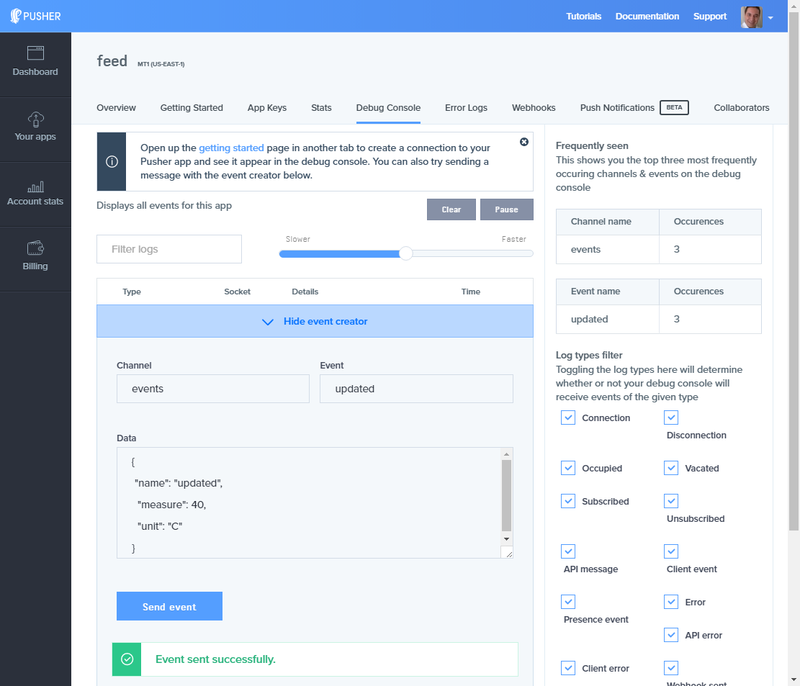 In the frontend, those events will be shown in an activity feed made with React. This tutorial assumes prior knowledge of Node.js and React. 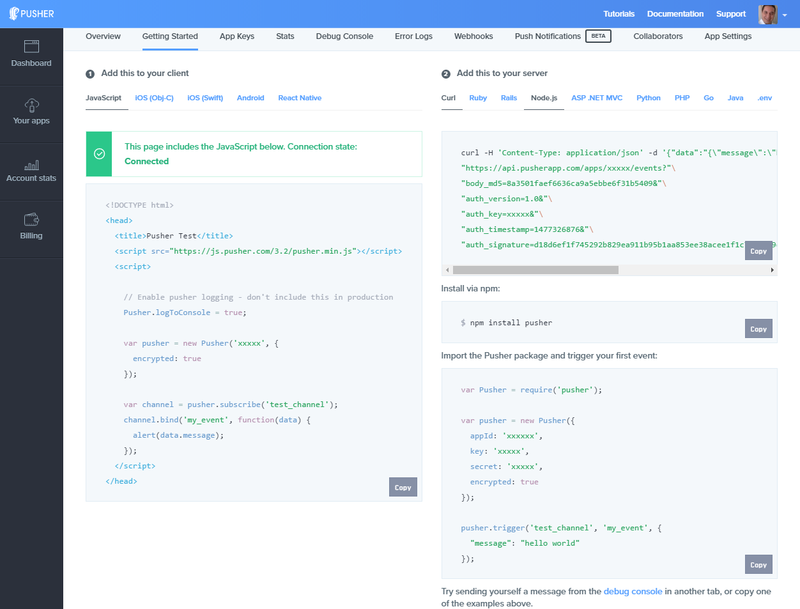 We will integrate Pusher into a Node.js API, create React components and hook them up with Pusher. However, since Pusher is so easy to use together with Node.js and React, you might feel that in this tutorial we will spend most of our time setting things up in the backend and creating the React components. You'll need to have access to a MongoDB database. If you're new to MongoDB, you might find this documentation on how to install it handy. The source code of the final version of the application is available on Github. The model directory contains the Mongoose schema to interact with the database. 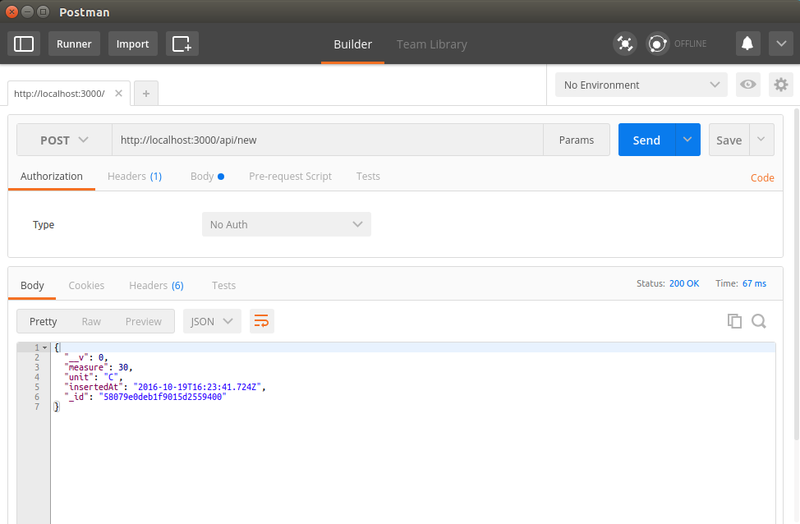 The routes directory contains the server's API endpoints and the route to server the main page of the app. The view directory contains the EJS template for the main page of the app. In the root directory, we can find the package.json file with the project's dependencies and the file for the Express server. Enter a name, choose React as your frontend tech, and Node.js as your backend tech. This will give you some sample code to get you started. This won't lock you into a specific set of technologies, you can always change them. 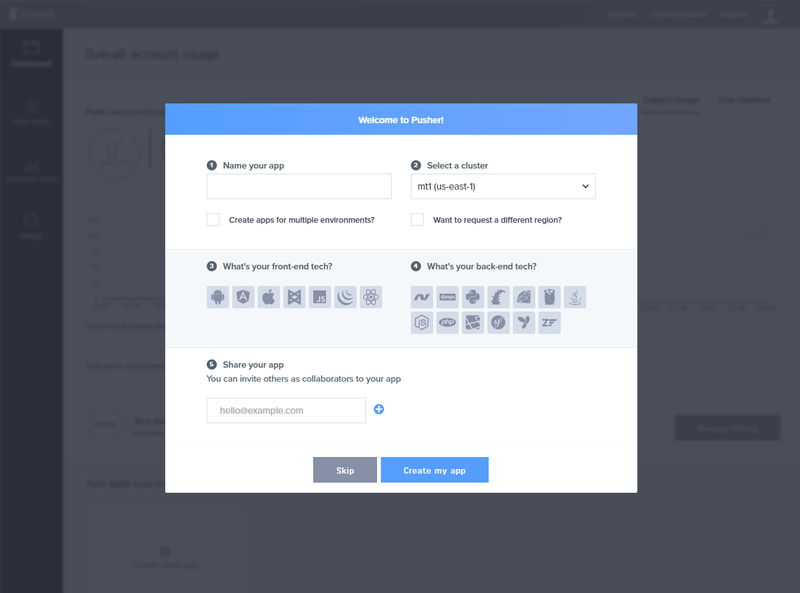 With Pusher, you can use any combination of libraries. Pusher can be used to publish any events that happen in our application. These events have a channel_, which allows events to relate to a particular topic, an _event-name used to identify the type of the event, and a _payload_, which you can attach any additional information to the message. We are going to publish an event to a Pusher channel when a database record is created/updated/deleted with that record as attachment so we can show it in an activity feed. This way, we'll be listening to these events to update the state of the client in the frontend. React thinks of the UI as a set of components, where you simply update a component's state, and then React renders a new UI based on this new state updating the DOM for you in the most efficient way. There are two important things in this code. The second thing is that the insertion of a new event is done with the ReactCSSTransitionGroup add-on component, which wraps the elements you want to animate. By default, it renders a span to wrap them, but since we're going to work with li elements, we specify the wrapper tag ul with the component property. className becomes a property of the rendered component, as any other property that doesn't belong to ReactCSSTransitionGroup. 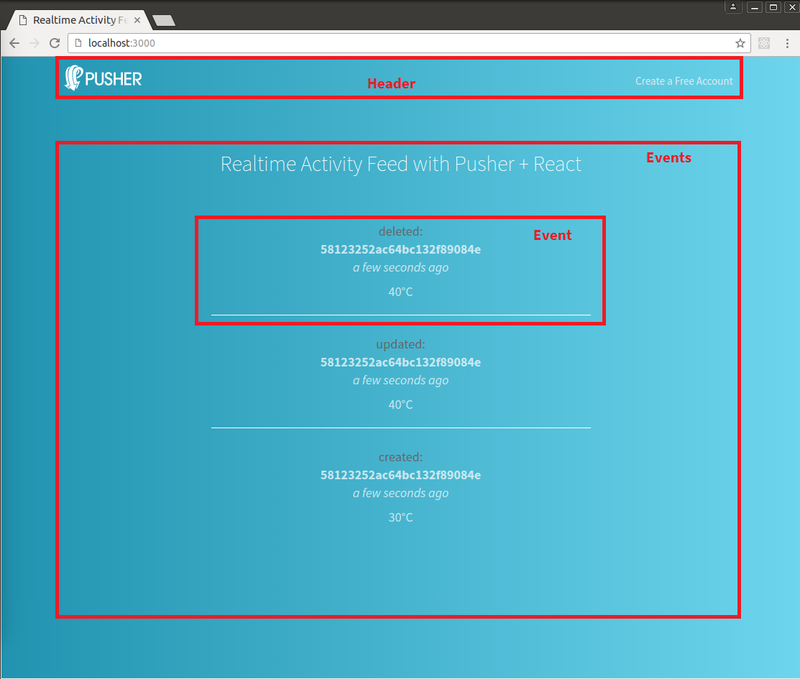 In this tutorial, we saw how to integrate Pusher into a Node.js backend and a React frontend. As you can see, it is trivial and easy to add Pusher to your app and start adding new features. Remember that if you get stuck, you can find the final version of this code on Github or contact us with your questions.